The MK5 is the best version yet! Fully repairable/ replace-able dual-compound Vibram outer sole with moulded toe bumper and aggressive sole pattern for good traction. Angled heel-cleats for improved downhill grip. Protective rubber rand around boot increases water-resistance, rigidity and durability, also makes boots easier to re-sole. One-piece water-resistant and breathable micro-fibre uppers. With Wind-Tex breathable and water-resistant membrane lining and insulation layer for padding and warmth. Lightweight, padded, soft and breathable faux-leather collar and tongue sections for comfort and protection. Bellows-tongue for increased water resistance. Padded and moisture-absorbing insole with medium/stiff midsole. 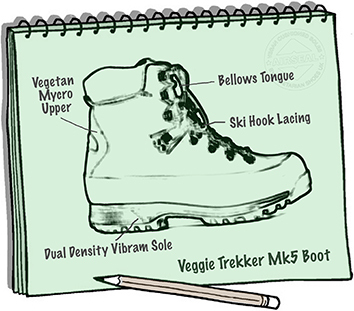 Ski hooks, lace-locking mid-way hook, and upper lace hooks make for quick and adjustable lace fastening. Uppers water-resistance can be improved with pollsh or dubbin and other regular shoe-care products. For best results with proofing agents pay special attention to seams and stitching.